When it comes to creating skillful players, we should look to parents -- not coaches. That is the message behind Tom Byer's "Soccer Starts at Home" movement. Byer, who's originally from New York, has spent the last 30 years in Japan and became a household name there because of his approach to the game. He is one of the most decorated and admired technical coaches in the Asian region. It should be no surprise that he experiments at home with his own kids. "I put two or three balls in every room in my house, and from day one, when 'Boy Boy' stepped up to play with the ball, I would discourage him from kicking," Byer told Houston's KTRK-TV recently. "I would encourage him to do more of this ball mastery, ball manipulation." Byer believes the starting line is at home, and it revolves around the parent-child relationship. At its core, the Soccer Starts at Home mindset emphasizes two things: the importance of getting children comfortable with having the ball at their feet as soon as possible, and the vital role that parents play in early childhood development. Chattanooga Football Club is hosting Byer in Chattanooga this week. Because of his tight schedule there will not be time for a public event. However, CFC Academy coaches have been invited to an evening with Byer. 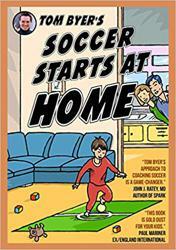 Tom Byer's popular book, "Soccer Starts At Home", is available on Amazon. Even though Tom has been teaching soccer to children for over two decades, it wasn't until he had two children of his own that he understood he'd been missing something. And he realized that it wasn't just him, but the soccer world in general that was ignoring soccer's youngest age bracket. Can you teach football skills to a 2-year-old? Tom decided to find out.